To many people (both private and professional alike), the idea of purchasing a property through auction is not one to be entertained. However, we believe that buying a property at auction can be a simple and clean-cut process that is open to a wide variety of purchasers. 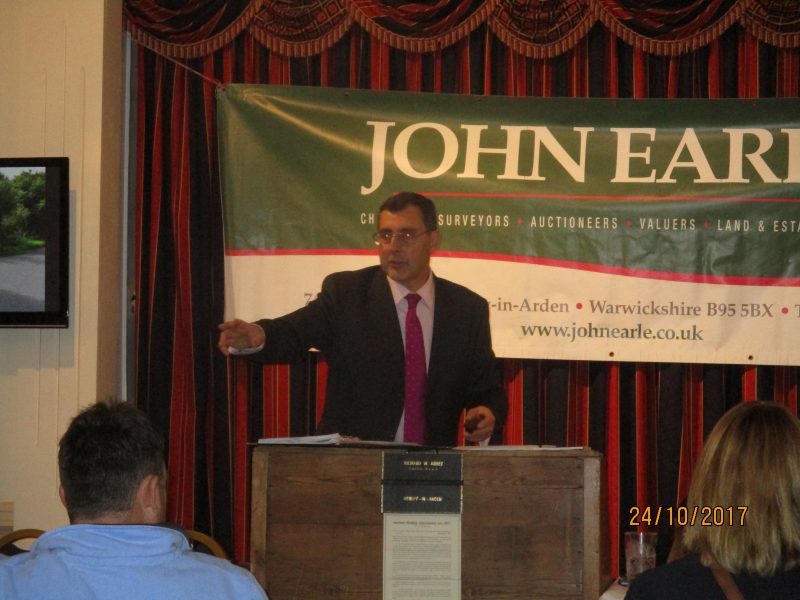 Here at John Earle, we hold monthly Land & Property auctions during the spring, summer and early autumn months. All auction dates are available on our website, together with the results of previous auction sales. Each auction contains no more than about 12 Lots, usually with a mix of both land and properties. This allows us to provide a full and thorough service to the individual needs of each client and buyer. We advertise our auction Lots 6 weeks in advance of the auction date in the local newspapers, our own website plus various other property websites such as RightMove. Here you will find full sales particulars along with a guide price. If you require details to be posted or emailed to you, then please feel free to contact the John Earle office. Viewings: Where properties are concerned, it is usual practice to conduct block viewings by appointment at each property. These are set up to allow as many people to view as possible within a designated timeframe. Â With parcels of land, it is usual practice for potential purchasers to view unaccompanied, however you must have a set of our sales particulars with you at the time. If you like an auction Lot and decide that you would like to bid at the auction, please advise us as we can then update you of any amendments that might affect the sale of the property or changes in the guide price prior to auction. Professional Guidance: You will need to appoint a Solicitor and it may also be in your best interests to obtain a professional survey on the property prior to the auction for your own piece of mind. Legal Pack: Each auction Lot is offered with a “legal pack”, this is prepared by the vendor’s solicitor and contains:- Title information; searches; leasehold / freehold documents and the sales contract. Â You can find the vendors solicitor contact information on our sales particulars. Finances: Your finances will need to be in place prior to the auction. If you are successful then you will be required to pay a 10% deposit on the fall of the hammer price, as this is officially when contracts are formally exchanged. At John Earle we usually set the completion date 28 days after the date of the auction. Insurance: In general the insurance of a property becomes the buyer’s responsibility on the fall of the hammer, so you will need to have arrangements in place for this. Other Costs: At John Earle we DO NOT charge a “buyer’s premium”, and there are no other costs payable by the purchaser except for the usual fees associated with the purchase of a property such as Stamp Duty. MOST IMPORTANTLY – if in doubt then please ask us – we have been auctioning land and property for over 80 years and are very happy to assist and advise you in this process.